The drive across the west Norfolk flats, into Lincolnshire and around the Wash, was eerily quiet... Even RoadTour, which usually chats away at fairly regular intervals, was silent for the entire journey into Lincolnshire. So it was a relief to find civilisation once again in the form of Stamford - a beautiful, historical stone town just off the A1. 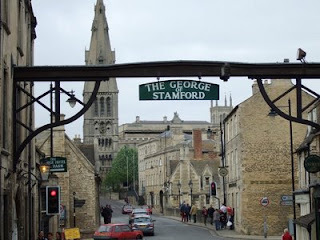 With more than 600 medieval and Georgian listed buildings lining the numerous narrow cobbled streets, alleys and picturesque squares, Stamford is virtually untouched by modern architectural influence which made it the perfect setting for the BBC's costume drama Middlemarch. The town’s name derives from a stone ford – then the only crossing point over the River Welland - over which Queen Boudicca is reputed to have chased the Romans in AD 61. Lying as it does on the main Roman route (Ermine Street) from York and Lincoln to London, Stamford attracted many other royal and noble visitors - Sir Walter Scott described the town’s mellow limestone facade as 'the finest scene between London and Edinburgh'. Yet in spite of all these credentials, Stamford does appear to be slightly off the tourist trail. Its streets are refreshingly devoid of the troups of American sightseers and coach loads of French exchange students which you find in just about every other English historical town. So I felt I blended in rather well with the locals as I mooched around its pretty streets. 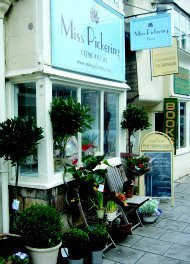 Nestling alongside the usual high street fare, there is a great range of independent stores, boutiques, galleries and other little treasures. 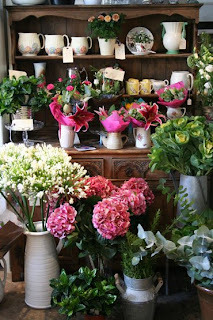 I loved this florist – the cutely named ‘Miss Pickering Flowers' on St Paul's Street. Just a few doors up on the same street, there’s a fantastic deli - Simpole Clarke - which has its own refrigerated cheese room where 100 different varieties of cheese are nurtured by owner Julie Simpole Clarke.